Pilates is a unique form of exercise developed by Joseph Pilates over 50 years ago, designed to strengthen the deep core muscles which give stability to the spine and so helps maintain a healthy back. Pilates is a mind and body technique requiring co-ordination of breath, movement and concentration on different body parts to perform precise smooth flowing movements. This form of exercise creates a balanced, toned and flexible body. The muscles are worked safely with no impact, making it ideal for those with joint issues, it helps prevent the recurrence of low back and neck pain. Pilates improves posture thus reducing the tension and soreness held in the neck, shoulders and back and producing a feeling of relaxation and a sense of well being. People who benefit from Pilates include those with back and neck pain, joint pain and stiffness, general debility, weakness, poor balance, fibromyalagia, recovering from injury. Pilates is suitable for all, regardless of age, ability or experience eg athletes and dancers, pregnant and post-natal women, the elderly, singers and musicians. The classes, which last 1 hour, start with a warm up and stretches, followed by flexibility and strengthening for all areas of the body and then cool down and relaxation. Pilates exercises are practiced in sock soles and clothing that allows you to stretch and get down and up from the floor. All equipment is provided. 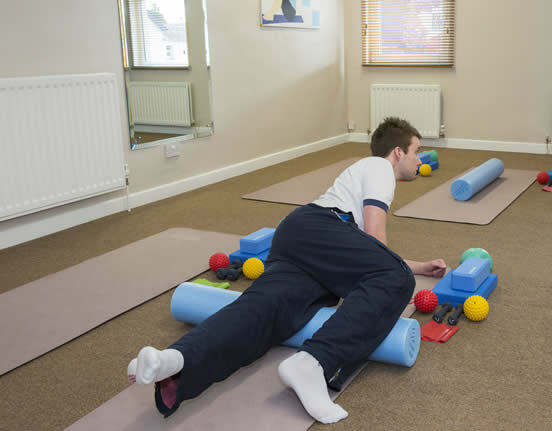 Our class sizes are limited to a maximum of 9 people to ensure close supervision by the physiotherapist. Beginners, intermediate and advanced classes are available aiming to have groups of similar ability together. Classes run in 8 week blocks, cost £72 per block, booking is essential. Classes are held on Tuesday & Friday mornings and Thursday evenings. Contact advance Physiotherapy & sports injury clinic for details and advice on which class would suit you. One-to-one Pilates appointments can also be booked. Appointments are available Monday to Friday 8:30am - 7:00pm. Home visits can also be arranged if appropriate.